On RunnersWorld.com today, there is a blog about your top 5 running moments this year. This got me thinking about what my top moments for this year were. Overall, 2008 has been a great year for running for me. I fully got back into running and discovered an entirely new side of myself because of it. This is the first full calendar year of running for me after my knee injuries. This year, I was able to complete 2 full marathons and 3 half marathons. Hopefully in 2009, I will be able to add even more races to my name. Without further ado, here are my top 5 running moments in 2008. 5. Getting back into running after knee surgeries. While I started back up in 2007, this is my first full calendar year of consecutive running. I only took a month off to recover after my first full marathon. To date, I have logged more than 1,000 miles in 2008. 4. Helping a former colleague catch the running bug. Yes, Ricca, this is you J I am more than thrilled that you have caught the running bug and couldn’t be happier for you. I hope there are many more runs and races in your future. 3. Saturday morning long runs. I look forward to these every week. I love running with my Pacer buddies. 2. Finally getting a PR (1:50:15) in the Half Marathon after a year of first setting that time. 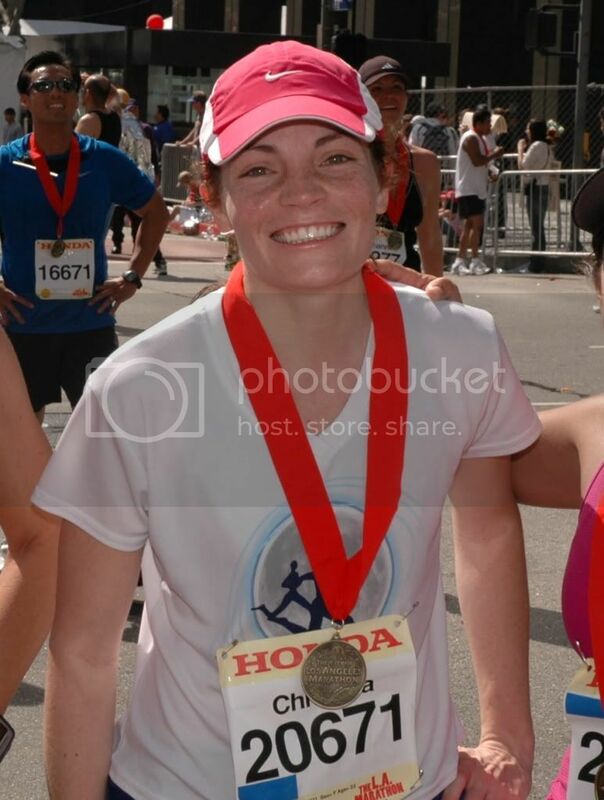 I PRed at the City of Angels Half. It was the same race as my full race, which proved to be a difficult time to beat. This is also one of my favorite courses. 1. Crossing the finish line at my first ever full marathon. It was a long and painful 26.2 miles. For my first full, I underestimated the length of the race. It was all worth it though. I have never been so proud of myself as I was that day. This entry was posted in Half Marathons, Life, Marathons, Training. Bookmark the permalink.